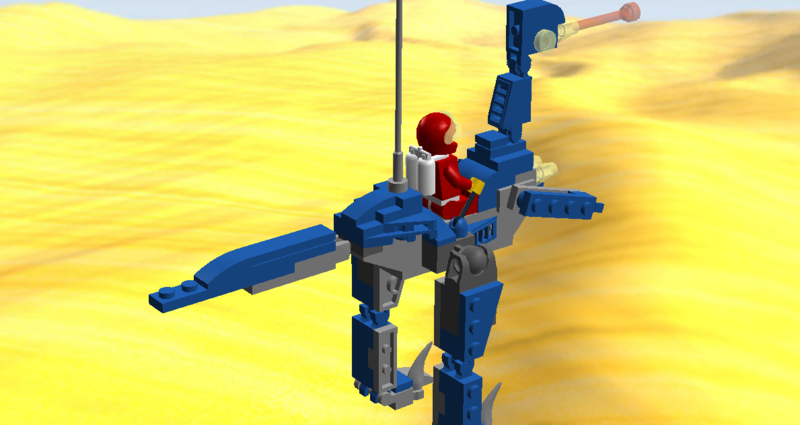 Continuing the series of dinosaur-derived Neo-Classic Space vehicles, I present the VLC Troodon mini-mech. It was clear that while the VLC Raptor is a relatively light vehicle as mechs go, it was still too bulky to realistically fit inside the cargo bay of any vehicle designed as a rough equivalent to the LL928-series Space Cruiser/Galaxy Explorer. And such is the Pliosaur-class. To do that, I had to go not larger, in a big Tyrannosaurus mechs, but smaller. A mini-Raptor. The Troodon is that smaller dinomech. This mini-mech is produced by the VLC Corporation of the Saurian Sector as a small personal mobility vehicle. Designated the Troodon, the vehicle is the smallest dinomech produced by VLC Corp.
Due to the rugged nature of many of the Sector’s planets, mechs are far more suitable than rovers for surface mobility, and the rover of the old LL928 series Galaxy Explorer has been replaced by other vehicles in the large LL1028 series Saurian Sector Explorer, also known as the Pliosaur-class (article forthcoming). Chief among these is the VLC Troodon dinomech. Due to the necessity of fitting into a fairly constrained cargo bay area, the mech has been designed to partially fold up into a relatively small volume. The hinged tail is part of this folding ability, as is the ability of the mech to disembark an LL1028-series vessel remotely without a pilot on its back. 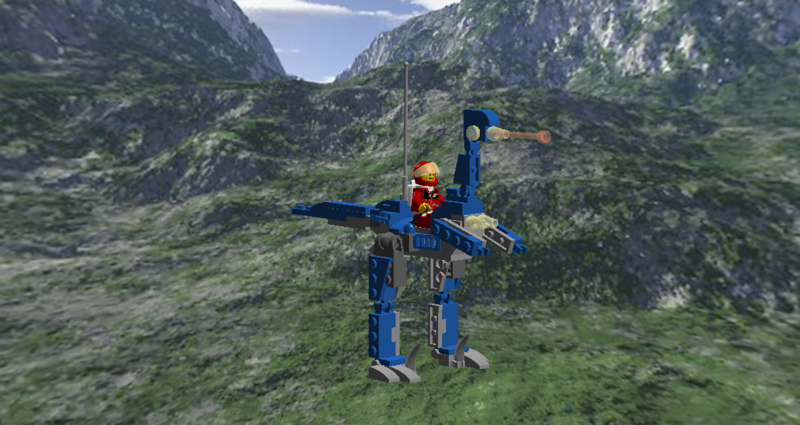 The VLC Troodon’s pilot controls the vehicle via a handlebar-type controller mounted on the neck. The operator may either stand atop the small dinomech’s back (usual operations) or sit just behind the neck (which may be more comfortable for long-duration missions but which is less stable at high speed). The Troodon is far more minimally-armed than the larger Raptor mech, with only a single head-mounted laser cannon as ranged armament. The single claws mounted in the arms can be used either for close-quarters battle, or more commonly to aid in climbing. Its minimal armament reflects its different role; the Raptor is an armed vehicle for reconnaissance-in-force, whereas the Troodon is more of a light explorer and general mobility vehicle. 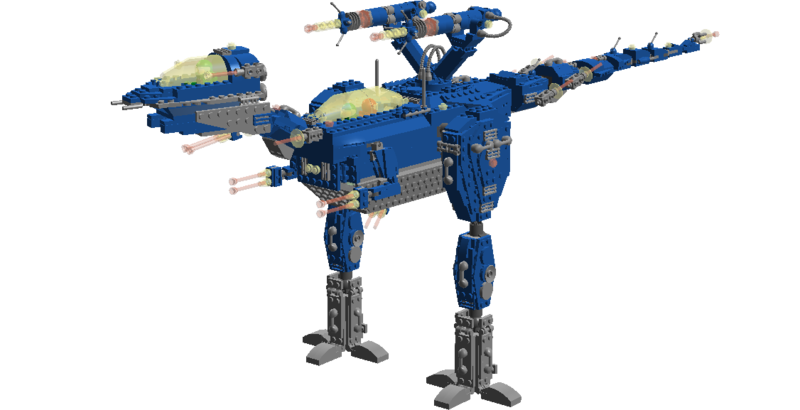 This entry was posted in Lego Classic Space, Mechs, Prehistoric beasts, Saurian Sector and tagged digital Lego, Dinomech, LDD, Lego, Neoclassic Space, Space, Troodon on March 9, 2015 by geoffhorswood. 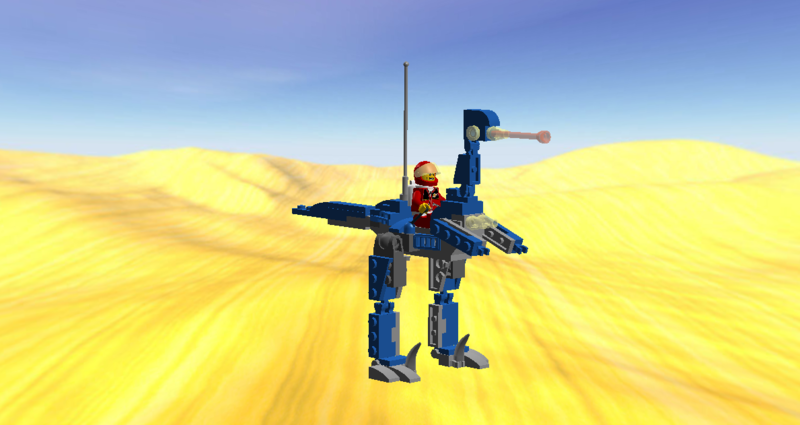 Once you start down the path of merging Classic Space Lego with dinosaur inspiration, forever will it dominate your destiny. Or in other words, I’ve been making more of these things. My original dinomech, the VLC Raptor, was effectively a test piece for the whole concept. I think it’s a fun idea, but even I can recognise that from an objective future-history point of view it makes only slightly more sense than Transformers Dinobots. Why would people from the galactic future model their space hardware after extinct reptiles from Earth? I’m ignoring this question, for the same reason that no-one seems to ask why it’s a good idea for alien robots to be able to disguise themselves as giant metal dinosaurs. Cool makes its own sense. I’ve continued on with making my Neoclassic Space dino-hardware. Terrestrial vehicles modelled on dinosaurs is, once you have the initial concept, pretty straightforward. Robot dinosaurs with cockpits. 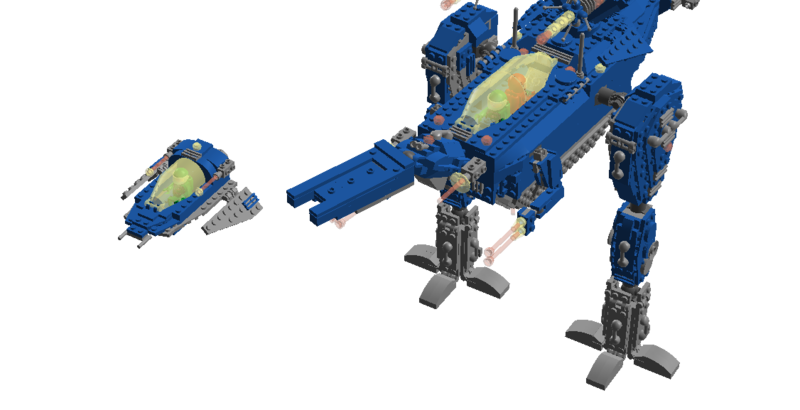 Zoids, but in Lego, and with a Classic Space vibe. Tyrannosaurus mechs and Mechaceratops and Seismechosaurus. But what about the spaceships? Spaceships modelled on pterosaurs would perhaps be the most intuitive approach, and it has something to recommend it. Winged, pterodactyloid spacecraft soaring through deep space… But mechanical pterosaurs somehow seemed more Steampunk than Classic Space, and I just wasn’t being very inspired. Also, the ships would end up all looking very much alike despite being vastly different sizes. Then it occurred to me that most sci-fi spacegoing organisations are structured as navies: (Starfleet, the Imperial Fleet, the Rebel Fleet etc). So why not a marine reptile? My initial inspiration, but finished more recently, was what has become the Pliosaur-class. Then I created a smaller ship. So now I have two dinomechs and two spaceships, and ideas for many more. All I needed was a backstory. And perhaps, given how well-armed my hardware is by comparison to the regular old Classic Space sets, an adversary. In my initial design decision to go with a Neoclassic Space feel, and in the details of creating the various ships and mechs that I have, I’ve begun to piece together some of the backstory. For example, the “VLC” in “VLC Raptor” initially existed to complete the thought of VeLoCiRaptor, but I decided that it made a great manufacturer designation and created the VLC Corporation. Also for example, the stuff is Classic or Neoclassic Space Lego, thus, it’s in the same universe as sets like the 928 Space Cruiser and Moonbase (known as the Galaxy Explorer in the US) and the 918 One-Man Spaceship, and presumably the 6930 Space Supply Station and its ilk as well. Whether this is precisely the same universe as Peter Reid’s book Lego Space: Building the Future is a slightly more open question, because I don’t know how “official” his future history is, and I don’t yet have the book anyway. I’ve almost certainly made a lot of different assumptions than Peter Reid did, but this is my corner of the Classic Space universe. I decided that, given the dinosaur subtheme, “the Saurian Sector” had a nicely appropriate ring to it as a milieu. So welcome to the Saurian Sector. The discovery of what came to be known as the Saurian Sector presented Space Fleet Command with new challenges and opportunities. On the one hand, the Saurian Sector contained the only known naturally-occurring sources of the energy-rich crystalline mineral Mesozorium. The lesser form Protozorium was known from other Sectors, though even that was rare, but the refining process of converting Protozorium to the more valuable and useful Mesozorium was both costly and time-consuming. The Saurian Sector, however, contained a number of planets with apparently naturally-occurring Mesozorium seams. On the other hand, the Sector included many planets with terrain so harsh as to defeat many of the wheeled surface vehicles that Space Fleet Command regularly relied upon, necessitating the development of an entirely new inventory of planetary vehicles. In addition, much of the Sector was contested space. The hostile Cephalon Dominion was also expanding into the Sector, and the competing claims remained a source of tension and conflict for many years. The ever-present Cephalon threat led to the development of a new generation of space vehicles alongside the new ground vehicles. Individual Federation Sector Commands had always been given wide latitude to design and build their own spacecraft and other equipment as needed, so long as it conformed to basic technological standards. But few Sector Commands had ever contemplated as complete a replacement of standard equipment as Saurian Sector Command now found themselves doing. Even venerable and ubiquitous ship types like the old LL928 series Galaxy Explorer were replaced by alternates like the LL1028 series Saurian Sector Explorer. Space Fleet Command raised no objections to the sweeping equipment changes that Sector Admiral Jael Thera was making, however. The fact of the matter was that a number of the old, weakly-armed Galaxy Explorer ships had disappeared, presumed destroyed, along the edges of what was known to be Cephalon space. An upgunned space exploration fleet was a perceived necessity. Besides, the mining and extraction of the Sector’s Mesozorium reserves was a great prize, and easily covered the development and retraining costs. Joining the LL1028 series Saurian Sector Explorer (“Pliosaur-class”) ships were the LL1024 series Transporter (“Nothosaur-class”) and LL1018 series space fighter (“Plesiosaur-class”). Even Space Fleet Command’s larger vessels saw general replacement in the Saurian Sector: the main Fleet vessels were the Ichthyosaur-class space frigate, the Mosasaur-class battlecruiser and the big Leedsichthys-class carrier. On the planetary surface, Saurian Sector Command utilised a number of walking, legged vehicles known as dinomechs, produced by the VLC Corporation, as well as vehicles like the Trilobite hovertruck and Ankylocrawler mobile Mesozorium-mining station. 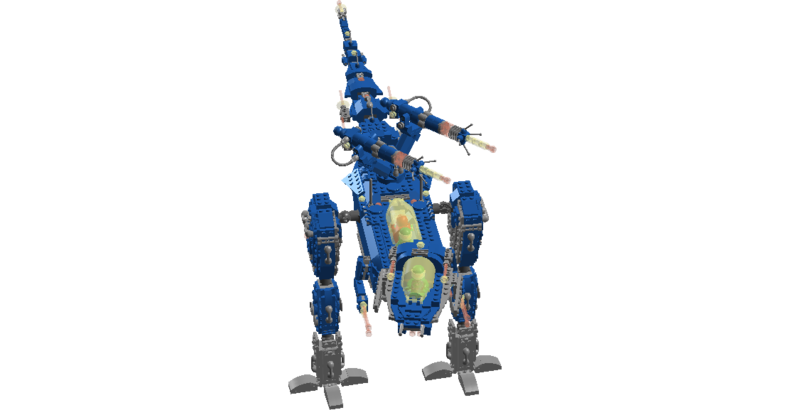 This entry was posted in Prehistoric beasts, Saurian Sector and tagged Dinomech, Dinosaur, LDD, Lego, Lego spaceship, Mechs, Neoclassic Space, Saurian Sector, Space on February 23, 2015 by geoffhorswood. Mechs are cool. Impractical in real life, but cool nonetheless. Classic Space Lego is cool. “Neo-Classic Space” stuff such as Peter Reid’s amazing creations are especially cool. 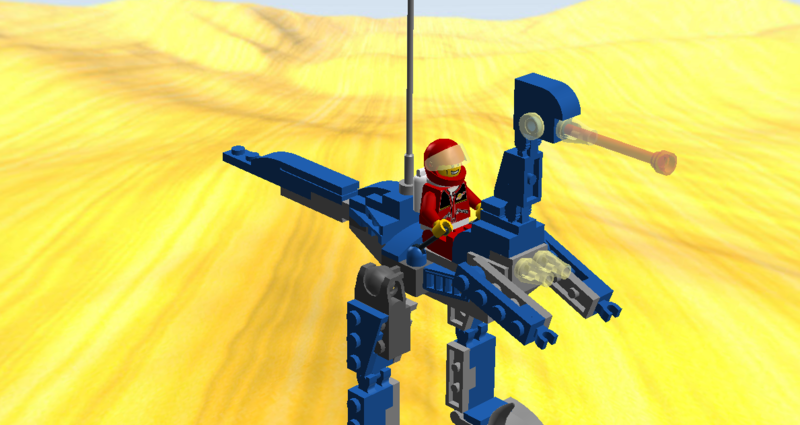 So… Neo-Classic Space Lego mechs shaped like dinosaurs, then. Gotta be awesome, right? Not having the bricks I needed in the colours I wanted, I had to make this dinomech digitally. And because no-one uses MLCad any more, I decided to bite the bullet and learn to use the Lego Group’s own Digital Designer. There are pros and cons to this transition. On the one hand, Lego Digital Designer (LDD) is a lot less finicky and a lot more instinctive to use, much more like building with actual bricks. The program knows how things fit together a lot more than MLCad, and won’t allow you to place bricks where they cannot go. It also has a much more up-to-date brick inventory. But on the other hand, MLCad has a much broader inventory of obsolete bricks that are no longer made. In addition, it has the ability to make any brick in any colour, even neon green axle rods if you so desire, while LDD restricts you to the palette of currently-available bricks. This is not an unreasonable imposition on the Lego Group’s part; just like in real life, you have to work with what they actually produce. But it is a limitation. Also, because I’m used to the way MLCad sorts bricks, I’m having difficulty finding what I need. This will change, but it’s annoying at the moment. Still, on the whole it’s been positive. I couldn’t have built this little dinomech in MLCad. And having proved the dinomech concept, this little guy will probably be the first of a whole series of T-Mechs and Ankylocrawlers, and perhaps even Mechatheriums. I’m calling it, for reasons that ought to be obvious, the VLC Raptor Mech, or Raptor for short. “VLC” doesn’t actually stand for anything; it’s there to complete the thought of “VeLoCi-Raptor”. I imagine it’s a makers’ designation, some future Lego equivalent of Honda or GMC. 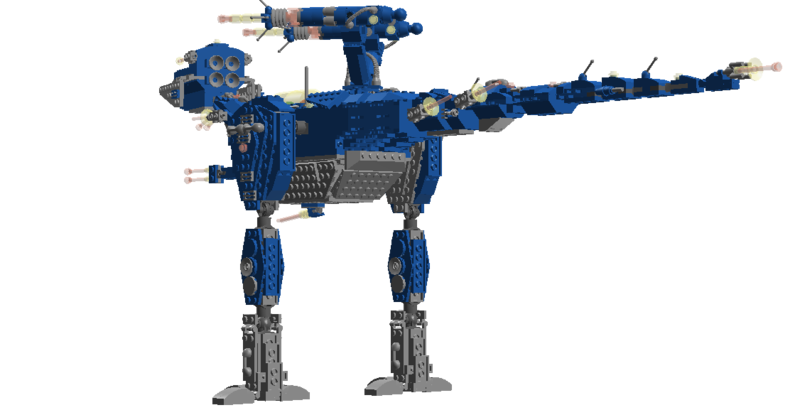 The VLC Raptor is a fast, well-armed scout mech designed for reconnaissance-in-force in hostile terrain. 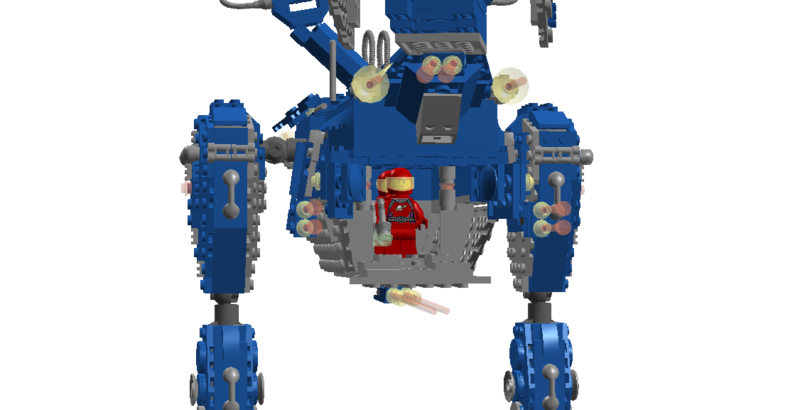 It has a laser cannon mounted in the head, a couple more in front, grabbing arms that can hold tools or weapons, and a pair of foot-mounted cutting blades for close combat. It’s probably the fastest and most agile of my planned dinomechs, and may be one of the most versatile. 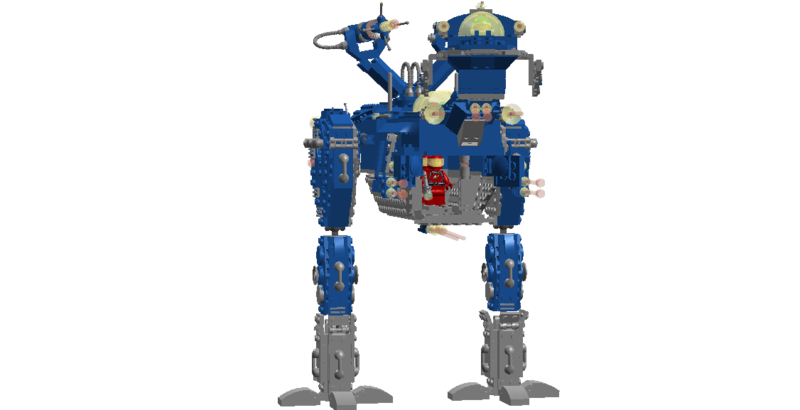 This entry was posted in Lego Classic Space, Mechs, Prehistoric beasts and tagged Classic Space Lego, digital Lego, Dinomech, Dinosaur, Lego, Lego Classic Space, Lego Digital Designer, MLCad, Velociraptor on February 4, 2015 by geoffhorswood.